People hire mold remediation companies to take care of household mold problems because they want to make sure the job is done right and all traces of mold are removed. Mold remediation is a complicated task and many homeowners don’t know how to do the job themselves, especially if mold is widespread or growing in hard-to-reach places like inside walls, under floorboards or inside heating and air conditioning ductwork. In addition, the Environmental Protection Agency (EPA) recommends hiring a professional if you have mold covering an area greater than three feet by three feet, if mold develops after flooding with contaminated water (or water that may be contaminated), if there is mold in your HVAC system or if you have mold-related health problems or other health issues that may be exacerbated by exposure to mold. If you follow the advice of the EPA and hire a professional, you expect the job to be done right. Most mold remediation companies do a great job, but sometimes they make mistakes. Here are a few of the most common mistakes and some tips on how you can make sure they aren’t made at your expense. 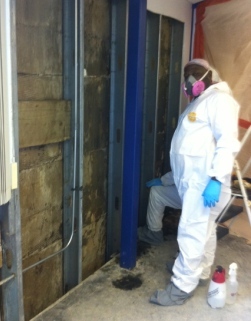 It’s natural to assume a mold remediation company would hire qualified professionals and many do. It’s unwise to assume all do, though. When selecting a mold remediation company, ask if employees are certified by an organization like the National Organization of Remediators and Mold Inspectors or the Mold Inspection Consulting and Remediation Organization (MICRO). Ask about other qualifications of employees and how much experience they have. You should also ask if they guarantee their work. One of the benefits to hiring a mold remediation company rather than tackling a mold removal job yourself is that professionals should know how to avoid spreading mold during the cleanup process and should also have all the necessary equipment to safely remove mold, like vacuums with HEPA filters. Most of the time they do, but sometimes mold remediation companies hire less-than-skillful employees or cut corners and end up spreading mold to other areas of the home. To prevent the spread of mold during the mold remediation process, professionals should use large sheets of plastic to cordon off areas in which they are working. They should have the equipment needed to create negative pressure in work areas to prevent mold spores from drifting to other areas of the home. The negative air machines used should be vented to the outside. They should use vacuums with HEPA filters to clean up any debris created during the mold remediation process. According to the Minnesota Department of Health(1), they should also remove the outer layer of their work clothing in the work area so that they don’t spread mold spores from their clothing to other areas of the home. Perhaps the worst mistake anyone can make when doing mold remediation is leaving some of the mold behind. It’s possible to remove all visible mold but miss hidden mold, which can then begin to grow and spread again. It’s an easy mistake to make and it’s critical to make sure your mold remediation company does a thorough job. The best way to make sure a mold removal job is done right is to hire a certified mold testing professional to supervise the work and to test your home afterward to make sure that the mold has been properly cleaned. It is impossible to remove every mold spore since mold spores are microscopic and can be in the air, but if levels in your home match levels outside of your home, that is usually considered acceptable. A trained mold testing professional will usually use this comparison to judge the results. Look for a mold tester that is certified by an organization like the National Organization of Remediators and Mold Inspectors, the Professional Mold Inspection Institute (PMII) or the Mold Inspection Consulting and Remediation Organization (MICRO). Hire a mold tester that doesn’t work for, and is not associated in any way, with the mold remediation company you hire. That way there is no conflict of interest. For a list of qualified mold testers in your area, just follow the link. Understanding Mold Reports - Guide to understanding the assessment and report issued by the mold tester.